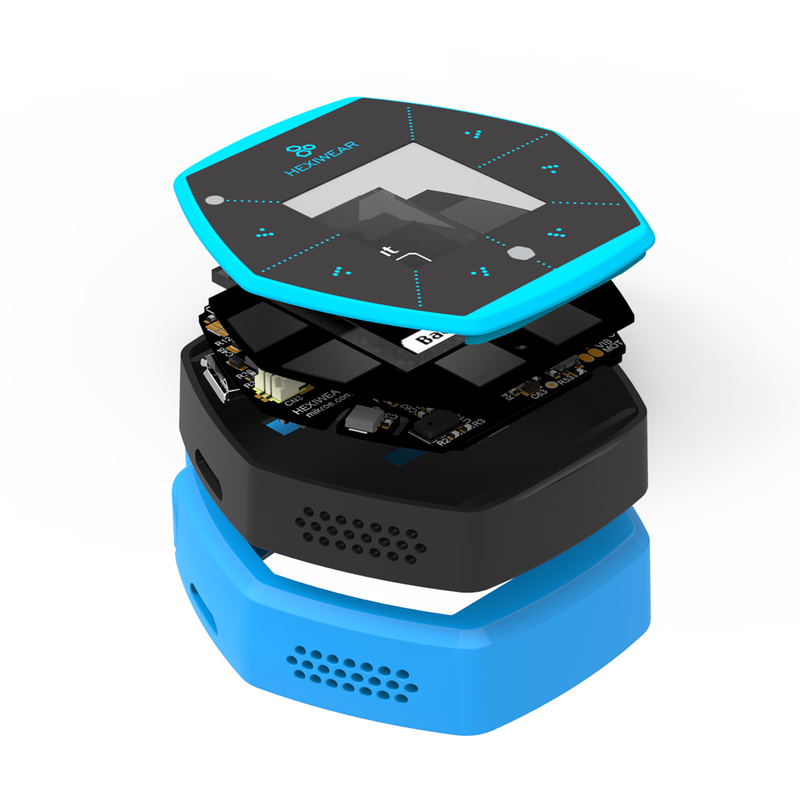 Hexiwear is powered by a Kinetis K64 microcontroller based on the ARM Cortex-M4 core. Another Kinetis wireless MCU, the KW40Z, provides Bluetooth Low Energy connectivity. Hexiwear also integrates a wide variety of sensors, as well as a user interface consisting of a 1.1” 96px x 96px full color OLED display and six capacitive buttons with haptic feedback. Eye-catching Smart Watch form factor with powerful, low power Kinetis K6x MCU and 6 on-board sensors. Designed for wearable applications with the onboard rechargeable battery, OLED screen and onboard sensors such as optical heart rate, accelerometer, magnetometer and gyroscope. Designed for IoT end node applications with the onboard sensor’s such as temperature, pressure, humidity and ambient light. Flexibility to let you add the sensors of your choice nearly 200 additional sensors through click boards. The K64F SoC has five pairs of pinmux/gpio controllers. The K64F SoC is configured to use the 12 MHz external oscillator on the board with the on-chip PLL to generate a 120 MHz system clock. The K64F SoC has six UARTs. One is configured for the console, another for BT HCI, and the remaining are not used. The Hexiwear docking station includes the NXP OpenSDA serial and debug adapter built into the board to provide debugging, flash programming, and serial communication over USB. To use the pyOCD tools with OpenSDA, follow the instructions in the pyOCD page using the DAPLink Hexiwear Firmware. The pyOCD tools are the default for this board, therefore it is not necessary to set OPENSDA_FW=daplink explicitly when using the default flash and debug mechanisms. With these mechanisms, applications for the hexiwear_k64 board configuration can be built and flashed in the usual way (see Build an Application and Run an Application for more details). To use the Segger J-Link tools with OpenSDA, follow the instructions in the Segger J-Link page using the Segger J-Link OpenSDA V2.1 Firmware. The Segger J-Link tools are not the default for this board, therefore it is necessary to set OPENSDA_FW=jlink explicitly in the environment before programming and debugging. The OpenSDA adapter is shared between the K64 and the KW40Z via switches, therefore only one SoC can be flashed, debugged, or have an open console at a time. This example uses the Hello World sample with the pyOCD tools. You can debug an application in the usual way. Here is an example for the Hello World application. The K64 can support Zephyr Bluetooth host applications when you configure the KW40Z as a Bluetooth controller. Download and install the KW40Z Connectivity Software. This package contains Bluetooth controller application for the KW40Z. Flash the file tools/binaries/BLE_HCI_Modem.bin to the KW40Z. Now you can build and run the sample Zephyr Bluetooth host applications on the K64. You do not need to repeat this step each time you flash a new Bluetooth host application to the K64. Navigate to the Zephyr samples/bluetooth/peripheral_hr sample application, then build and flash it to the Hexiwear K64. Make sure the OpenSDA switches on the docking station are configured for the K64. Reset the KW40Z and the K64 using the push buttons on the docking station. Open the app, tap the Heart Rate feature, and you should see a Zephyr Heartrate Sensor device. Tap the Zephyr Heartrate Sensor device and you will then see a plot of the heart rate data that updates once per second. Last updated on Aug 10, 2018.